This year I have made a few resolutions to improve my garden, based on last year’s experiences and shortcomings. My resolutions include mulching, succession planting, staying ahead of the weeds, and tracking the value of my harvests. Last year when I began our garden it was sort of unplanned and half-cocked. I had a garden in Nashville, but when we moved out to the country it took me a few months, until April/May before I worked up the nerve to ask the landlords if I could dig up a garden, by then it was really hot and really late. This year I have a nice diagram of what I want where, along with planting dates for succession planting, so we can have beans all spring and summer, instead of a freezer-full all at once. Leafy greens and quick maturing vegetables are being planted numerous times, every two weeks. I am also doing multiple plantings of summer squash and corn, so hopefully we will have more of a balanced harvest through the fall. For corn I am growing two heirloom varieties Golden Bantam Improved and Stowell’s Evergreen. Since I want to save seeds, I need them to tassel at different times so they won’t cross pollinate. I have already planted the Golden Bantam which matures in 85 days. I am waiting for the Golden Bantam to germinate before planting the Stowell’s, which takes approximately 100 days to mature. Mulching is also something I want to try, to conserve water, control soil moisture and temperature. I hope to use mulches to prolong the harvest of cool season crops, like peas, lettuce, etc., and also control soil conditions for tomatoes, bell peppers and plants that can have difficulty setting fruit in rapidly fluctuating soil conditions. The Cooperative Extension of Virginia has a very inclusive article on Mulching Vegetables, which covers newspaper, grass clippings, and leaves. I am planning to use a blend of deciduous leaves and grass clippings, to counteract the nitrogen-depleting effects that some rapidly-decomposing mulches have on available nitrogen. I am going to stay ahead of the weeds this year. Last year I think some of my crops, mainly corn, could have performed better if they weren’t smothered by quack grass. 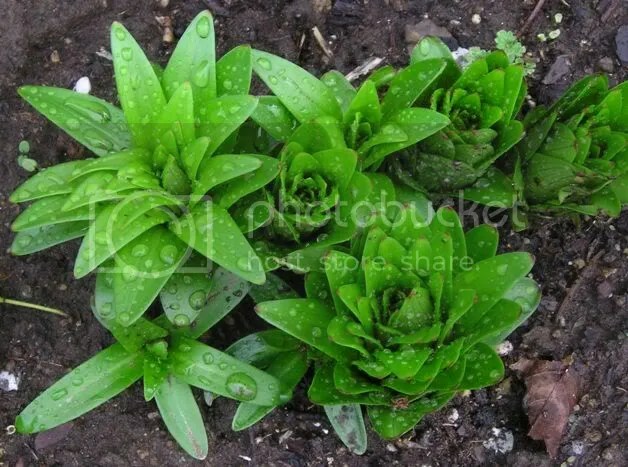 I am going to get out there especially after it rains when weeds are easy to pull and new ones are popping out. Last year I was totally inspired by the recording keeping of Mrs. Dobby at the Dobby’s Pumpkin Patch, who harvested over £1000 of fruit and vegetables from her allotment. According to my balance sheet I have spent 72.35 on seeds and seed potatoes, this does not included fencing and tomato cages, etc., purchased last year. This year I already have an Excel sheet ready to track my savings! Exciting. What are your new year’s gardening resolutions? This year I am two to three months ahead of where I was last year. Potatoes and Peas are the first things up this season. We planted the potatoes over several weeks, beginning February 10. 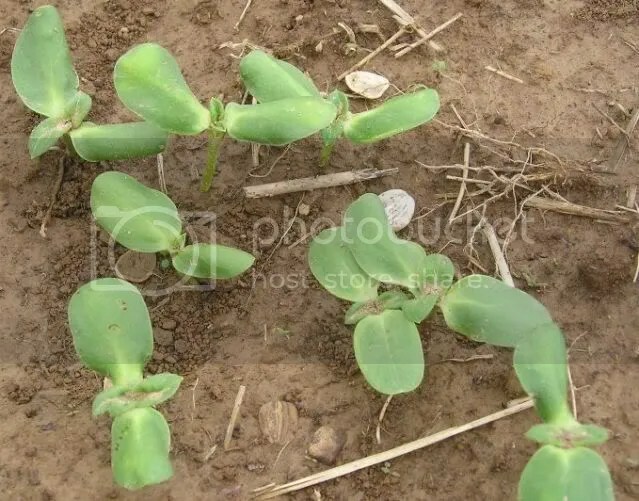 The peas were planted in January after the 15th, according to dates suggested by the 2008 Farmer’s Almanac. We have purple-podded Capucijner blauschokkers. A starchy pea that makes delicious soup after the starches convert to sugars during the boiling process. 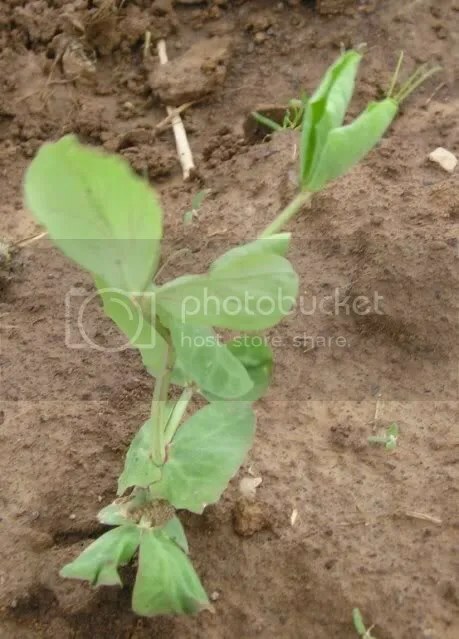 We are also growing Dwarf Grey Sugar Pea. Both are about three to four inches tall right now. Sunflowers, planted a few weeks ago, are already up. And Finally Potatoes! After one total crop failure I am extremely nervous waiting for potatoes to emerge. Just as I am ready to dig them up to see what’s going on, they pop out of the ground. I’ve already had a few failures. I had lettuce, cauliflower and cabbage ready to be transplanted when they just shriveled up and died. They already had numerous pairs of leaves. I’m not sure what happened. It was after a cold snap though, maybe they froze (?) They were yellow and shriveled. Spring has been in the air for a few weeks now and it’s even Spring by the calendar, but still I’m waiting for my tulips and daffodils. 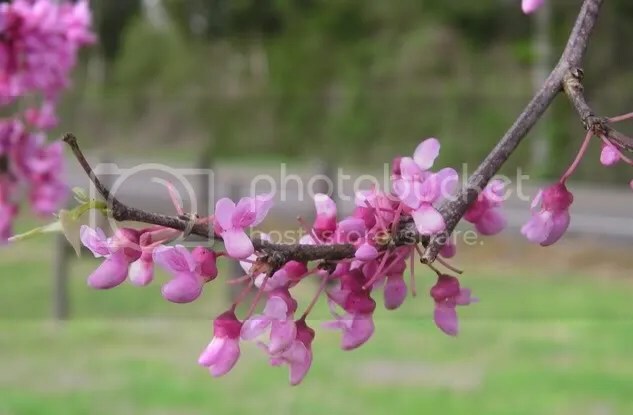 I only planted them last autumn, so I’m clearly expecting too much, but I’m not good at being patient, especially when there are buds tantalizingly close to popping open. 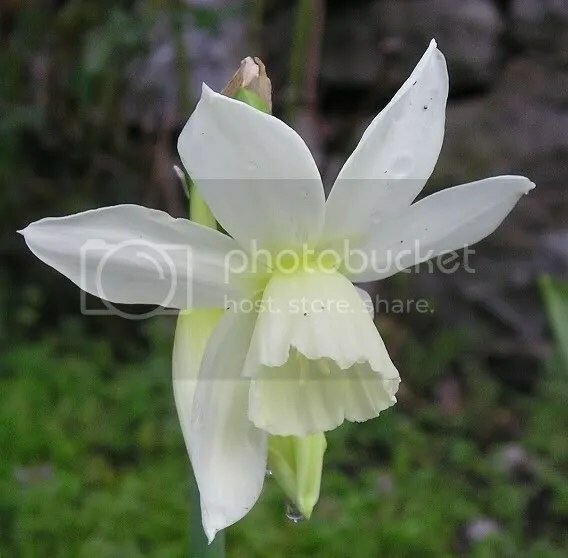 Thalia Daffodil. 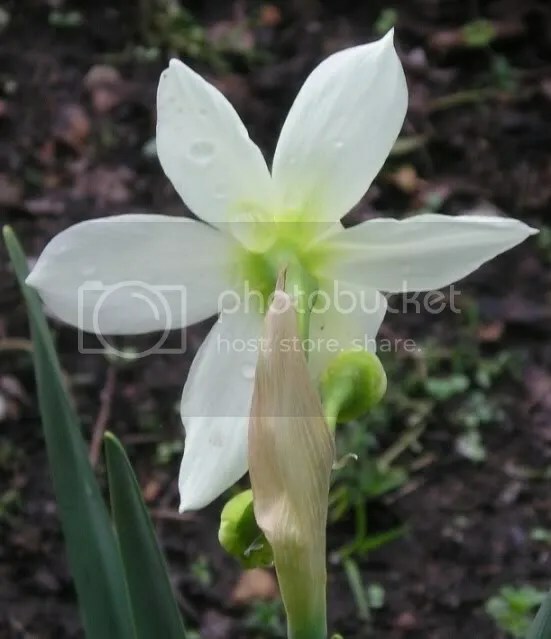 Similar to paperwhites, Narcissus papyraceus. Purportedly good for Southern regions. Unknown tulip. I should have saved the tag that came with the bulbs, because now I have no know of finding out what cultivar they are. I think they are pink and white of some kind. After the spring storm stopped and the sun came out, the first daffodil opened. They even look beautiful from the back when I go down the front steps to get the mail. I was hoping to post some photos on Friday, but my camera ran out of batteries as I was taking pictures. I kept putting in batteries that I thought were charged, but were empty, so I scared myself into thinking the camera was broken. Thank god it was just the batteries! I’m so glad it’s working again! Last fall I transplanted lily seedlings that I grew myself, from pots into the ground. I am happy to report that all three species lilies I planted have reemerged this spring! On right is the Formosa lily, a hardy road-side lily that can flower in 18 months from seed, in ideal conditions. 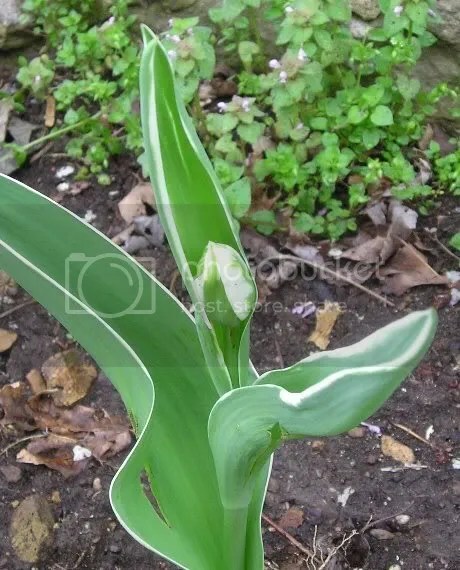 The Formosa lily kept its leaves all winter long, although they didn’t look very nice. The others died back completely. Again I had problem with my Sharpie plant tags fading in the sun. So I am unsure which are which. Anyway I was worried that the one in the middle wasn’t doing to come up, but sure enough it did. It just needed some warmer weather. 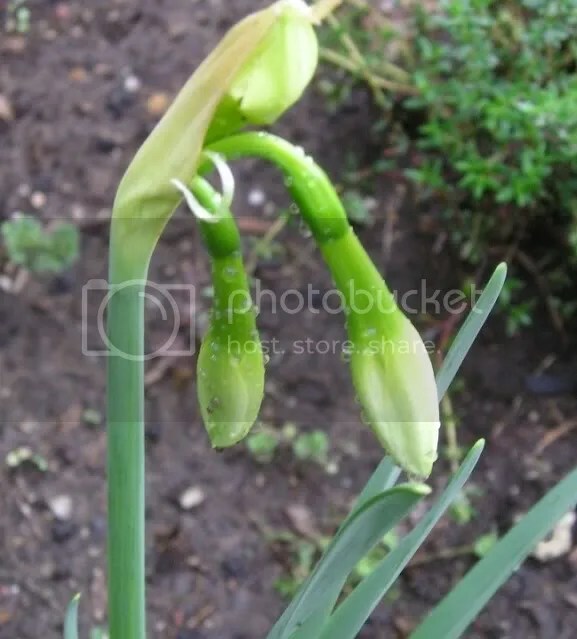 Some lilies can take up to eight years to reach flowering age, so do check before you unknowingly embark on a decade-long quest for lily flowers. An Asiatic I planted last spring has already come up and is looking vigorous. I planted two, ( it was a great deal like $4 per pot, from the nursery at the end of my road. EEEK!) but only one survived. I think the other was eaten by the moles. Does anyone else have a problem with Asiatic bulbs being eaten? This is my first experience growing lilies, so I am not sure, but I think these might be inflos? Does anyone know?